Is the golden goose poisoned before it’s even an adult? 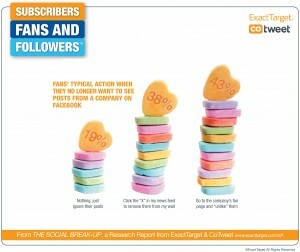 The current relationship between companies and consumers via social media and email is unsustainable. The backlash has begun, and abuse of any one channel has a spillover effect on consumer attitudes toward other channels. 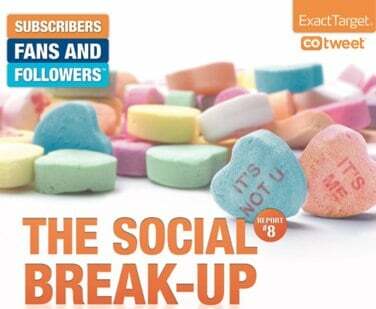 That’s one of my main takeaways from fascinating new research from ExactTarget and CoTweet (clients) called “The Social Break-Up” that studies why customers call it quits like Kim Kardashian and boyfriend du jour. I don’t like that email stat. Not one bit. We know that Twitter follows and Facebook likes are essentially digital bumper stickering. Clicking a “like” button one time isn’t exactly a blood oath. But if consumers are growing wary of email, which is a proven method of fostering deeper company-to-customer relationships, we’ve got a big problem brewing. As we strive to build more and more touch points and loose social ties between our companies and our customers, is it possible that we’re actually pushing them away? As marketers, email, Facebook, and Twitter share a common problem in that there is very little net cost for additional iterations. It doesn’t cost your company anything (other than a bit of labor) to send 7 tweets a day instead of 3. Or to write 4 status updates instead of 2. Or to send 3 emails per week instead of 1. Social media and email are inexpensive, and that allows marketers to make them cheap, untargeted, unfocused, irrelevant. We are smothering our very best customers with an invitation avalanche, asking them to hang out with us in every digital clubhouse we can devise. And the reality is, they just aren’t that into us. You might be thinking, “But it’s working! We have more and more followers and fans every day!” That may be true, but you may be burning out your best customers like a 15 year-old driving a stick shift on hilly terrain. And that’s the other part of this research that really shook me up. It turns out that much of consumers’ frustrations with companies’ social and email tactics is undetectable. They are cheating on us behind our backs, committing attention infidelity right under our noses. These findings underscore my belief that we must focus on measuring passion in social media, not aggregation. The fact that you have 50,000 followers means very little in terms of how many people will see (much less respond) to any specific Tweet. Using the 47% figure, your 50,000 followers might actually be only 26,500. How many of those are on Twitter at the point you send your tweet, or follow so few people or brands that they’ll see your Tweet when they do look at Twitter hours later? In email marketing, we often measure click through rate. The number of people on your list, compared to the number of people that click a link in your message. A click through rate of 7% is typically pretty solid. An email list of 50,000 should generate clicks from 3,500 recipients (of course, your results may vary widely). On Twitter and Facebook, a 7% conversion rate would be the stuff of legend (unless you’re Bieber or Gaga, in which case you probably don’t read this blog). How many clicks can you generate from your 50,000 Twitter followers? Again, your results may vary, but among my 33,000+ followers, 300 clicks is a pretty good showing. That’s a click through rate of less than 1%. Most of your Facebook Insights stats around story feedback show engagement rates in that 1% range, give or take. That means that just 1% of your Facebook fans clicked “like” or commented on your status update. Of course, your objective for every Tweet and status update isn’t to generate clicks. But sometimes, it most definitely is. What we find in “The Social Break-Up” is that consumers are already growing tired of speed dating brands, and will be playing increasingly hard to get. How can you rekindle the romance?